Peppers are a good source of Vitamin C, A, B6 and Silicon. 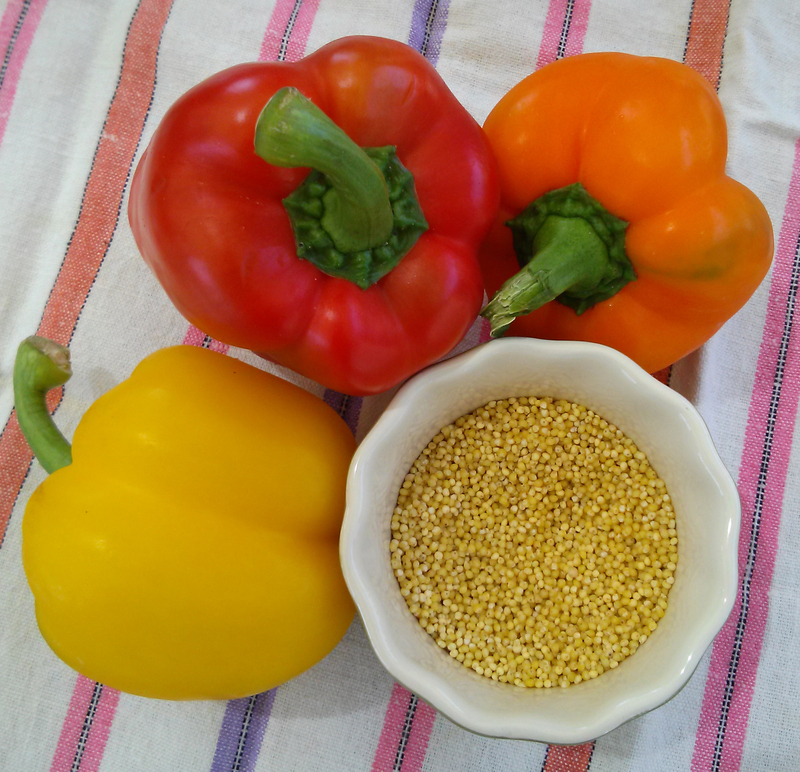 Millet is a gluten free grain (although, technically it is a seed) that is high in manganese, magnesium and phosphorus. Depending on how it is cooked, it can have a creamy consistency like mashed potatoes or a fluffy consistency like rice. For fluffy consistency, add one part millet to two and a half part water. Bring to a boil, simmer and cover. Cook for 25 to 30 minutes. For creamy consistency stir it frequently, adding small amounts of water until cooked. In a saucepan, bring millet and water to a boil. Reduce heat; simmer, covered and cook until water is absorbed. About 25-30 minutes. Millet will have a fluffy consistency. Meanwhile, cut tops off peppers and remove seeds. In a large pot, cook peppers in boiling water for 3-5 minutes. Drain and rinse in cold water; set aside. Saute green onions, garlic, celery for 15 minutes. Add black beans, cilantro, chopped almonds, salt, pepper. Add mixture to millet and let cool. Stuff peppers, place on oiled or parchment lined baking dish. Drizzle with oil. Cover and bake at 350° for 55-60 minutes or until tender.